The galaxy is a huge and varied place. Trillions of species on billions of worlds, and each a veritable repository of genomic resource to be turned to the will of the Omnissah and his Flesh Avatar the God-Emperor. 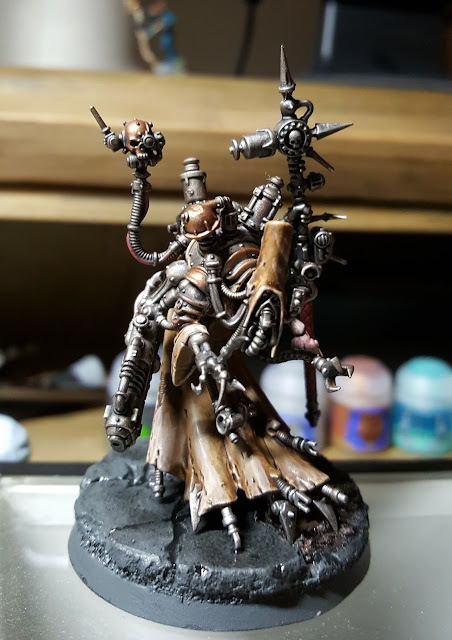 In this way, Magos Biologios Anat is divergent from the Cult Mechanicus in his belief that the flesh is not in fact fallible - the God-Emperor himself is flesh. Anat seeks the secret of what the flesh can attain amongst the stars. He gathers novel genotypes from living organisms across the Imperium and beyond its borders in order to study and experiment. He seeks to create and sculpt the perfect, warm flesh form to truly be one with the cold logic of the machine. The wide ranging explorations of Inquisitor Thaddeus suit him well and afford him the opportunity to harvest the galaxy’s biological riches. The riches of the galaxy have offered up opportunity within the biological matter of flora and fauna, and the fruits of this opportunity serve Anat and his associates. 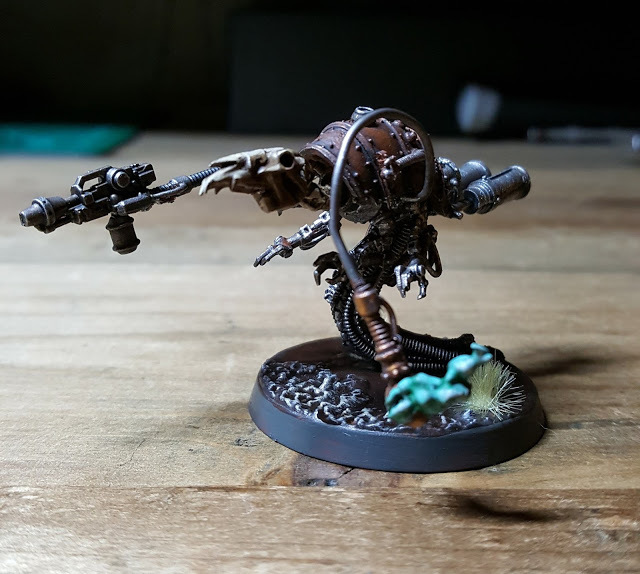 A host of geno-servitors; novel creations of machine and flesh dart and glide about him, fulfilling tasks of his devising - or on occasion of their own (surely a blessing of the machine spirit ). Some like the Genome Scavenger have autonomous tasks to locate, neutralise and collect new genetic material from the flora and fauna of a planet. A censer of nerve gas paralyses a subject organism before harvesting can take place. Where needed, dangerous or contaminated material can be incinerated. Some planets have far more hostile and aggressive locals. In such cases more active action is required in order to preserve the Great Work. 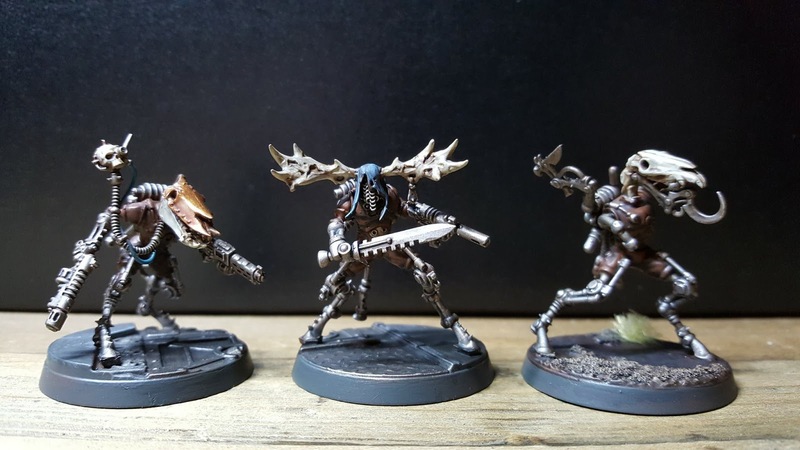 To this end, three Geno-Servitors; Mara, Svart and the miserable Malkin were grown using machine and equine biologicals in order to provide close and long distance neutralising options. The pinnacle of Anat's most recent works fusing animal and plant using a neuro-mycological framework has been of extraordinary success. Some unanticipated secondary behaviours have arisen, but these are merely a welcome blessing from the Omnissah. Clearly a reason or hymns and libations to the machine spirits house within. I have pretty much wrapped up the Morrighatti for the time being. I have a fair sized group and little inspiration for something new for the time being, I may well come back to do a miniature here and there at some stage. I have had a couple of ideas for new conversions and groups of themed peoples, and nicely they kind of all fit together , or at least will sit nicely together under the banner of the 'People of the Delta'. Within the realm of Ghur, along the Shattered Coast, lies the Delta. A vast region where three mighty rivers converge and spread out into a rich, verdant delta before draining into the wild oceans. This vast water-world would take days to cross on foot and is tangled with swamp, woodland, crawling waterways and streams. It teems with life. She carried her bloated form, leaning heavily on her staff. It had been almost a full day since she had left the previous settlement. A full day alone in the forest, winding along the tracks and pathways known to her people and the other, less welcoming inhabitants of the forest. She skirted past the swamp, too heavy, too weak to defend herself should she encounter trouble. The settlement of Tallebranch was due to be up ahead, it's semi-nomadic people following the traditional routes as the seasons passed; following their herds and the fruiting trees and bushes. It had been a full year since she had been to this place, a full year since the people had brought any sinners to the tent set aside for her. Once ensconced in her tent, and once darkness had fallen, they would tread quietly to her place at the edge of the settlement, bringing their shame. Mothers bringing children, husbands bringing wives or ageing relatives, all trying to hide the theft of their loved ones. The Sin Eater plays a crucial role within Morrighati society; for a semi-nomadic people living in a world where the souls of the children of the Morrighat are being freed and bound to the living; the risk of soul fragments binding to those unintended for apotheosis is high. As such, the Morrighatti people occasional begin to display signs of corruption and transformation. This is considered a thing of shame, an affront to the Morrighatt herself. To take her gifts rather than be given it is a thing of sin.